You are at:Home»Magazine»April 2019 Circuit: Homecoming Party, The Masquerade Ball, and More! What’s happening in Beijing’s international school community? See spring homecoming party, various performances, and sport matches in this month’s Circuit. 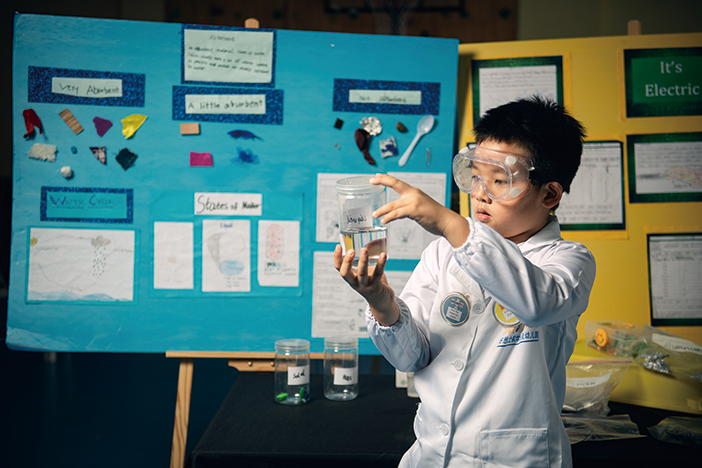 House of Knowledge (HoK) elementary students recently presented an impressive range of “exit points” (final results) for their World Studies projects at HoK’s Shunyi campus. The projects were, as always, embedded with the HoK core values: Design thinking, Communication, Inquiry, Global Mindset, and more. Recently, Grade 10 students at Beijing City International School (BCIS) began learning the fine art of ceramics. For their first lesson, they were given the task of starting the process of creating a pinch pot. As its name suggests, a pinch pot is a form of pottery that is made by pinching and turning clay. On February 27-28, Harrow Beijing students successfully staged their annual production. Their rendition of Beauty and the Beast captured the classic fairy story in a series of upbeat musical numbers. In order to help students adapt to school life as soon as possible and let new students integrate into the collective more quickly, No. 55 High School held a “Homecoming Party” in the basketball hall on March 6. Teachers and students of all grades took an active part in this activity. Western Academy of Beijing (WAB) has released its Season 3 varsity and junior varsity team photos. The student athletes will compete around the Asia-Pacific region in track and field, soccer, badminton, and softball. The British School of Beijing, Shunyi (BSB Shunyi) chess addicts had a once-in-a-lifetime opportunity to pit their wits against Grandmaster Zhao Xue. She played 21 simultaneous matches and defeated our “last man” standing, Year 8’s Felipe, at 1 hour 20 minutes, an impressive record since other schools normally lasted 30 minutes. In supporting a migrant school in Tongzhou District, Dulwich College Beijing’s Junior School Councillors visited the children, raised awareness of their needs, and organized several successful donation drives, collecting over RMB 11,000 as well as a shoebox full of presents for each migrant student. Roll up, roll up! 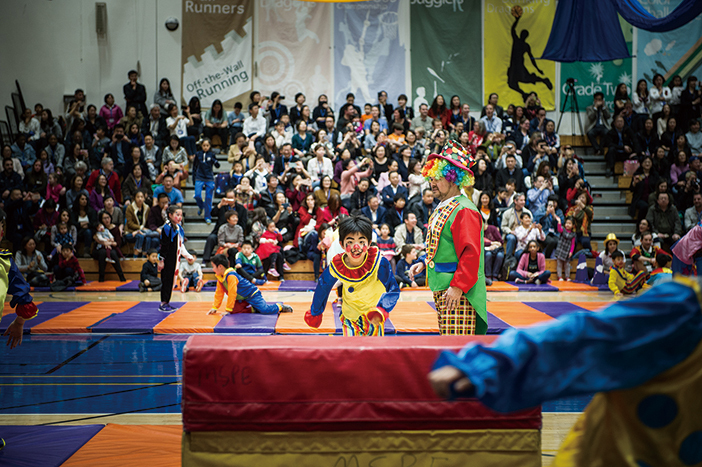 International School of Beijing (ISB) students staged a circus show. Gym 1 was transformed into a big top for one day only as the acrobats and clowns of grade 2 put on a circus show on Friday, March 8. In two performances, students and parents saw a wonder of athleticism, choreography, and color. Yew Chung International School of Beijing (YCIS Beijing) students hosted a great masquerade ball on February 15. The glamorous affair was a fundraiser for Roots & Shoots, A Voice for Animals, and Lost Puppies of Beijing. Students had a great time performing, running raffles, and selling masks they made themselves on the night. On February 26, the Beijing World Youth Academy (BWYA) secondary school held their Grade 10 personal project exhibition. Every year, the students produce strong results, and this year was no exception. With displays about Chinese architecture, Korean grammar, quadcopters, and much more, it was an abundant array of hard work and creativity. The British School of Beijing, Sanlitun (BSB Sanlitun) encouraged children to get #caughtreading by taking photos of themselves reading in exciting places. They also had a Book Fair during the week and the parents organized a book swap. To round off the week, March 8 was Dress Up As A Book Character Day. “Beijing vs. Asian All-Stars 2019”, an annual swimming event between international schools, took place from February 22-24, and once again the competition was fierce. Jennifer Zhang from the Daystar Academy bilingual school won the gold medal for the 50-meter breaststroke in the 7-8 years old group.